DVDs On Sale Now. Order directly through Kimberly and they are only $20 each, shipping and handling included. $50 gets you all three. Call Kimberly at 608-487-4879 or kimberlyamathews@gmail.com. 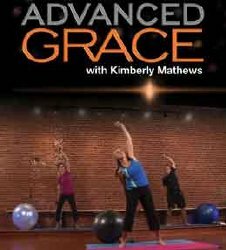 My Grace Class is a unique workout that’s good for both body and soul. It combines isometric exercises with full-body stretching, core strengthening, and relaxation breathing. All of this set to a background of Contemporary Christian music. Designed as an hour workout, it can also be done in 20 minute easy to follow sessions to fit a busy schedule. 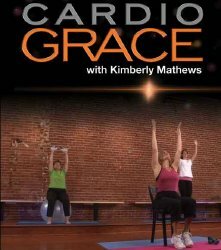 My Cardio Grace is a comprehensive workout with three different levels (chair, ball, mini-tramp) for those wanting a fun workout. Designed as an hour workout, it can also be done in 20 minute sessions to fit a busy schedule. First, a rockin’ cardiovascular session, followed by an upper body weight workout, then a relaxation and stretch routine. All of this set to a background of Contemporary Christian music. Simple to follow and extremely effective! What is Advanced Grace (Plus Abs)? My Advanced Grace is designed to be a challenge. It combines intense isometric strength training with full body stretching, relaxation breathing, and deep core conditioning. It’s an hour workout that can be done in 30 minute sessions. A bonus 35 minute ab. routine is included. All of this set to a background of Contemporary Christian music. It strengthens the body and soothes the soul.